Drummers are important for spectacle and communication - the original function of drumming during the civil war. Although drummers are very much part of the battle scene, they are generally treated as non-combatants - however, some do carry swords onto the field and can be found in the thick of the action when the armies close to hand-to-hand combat. 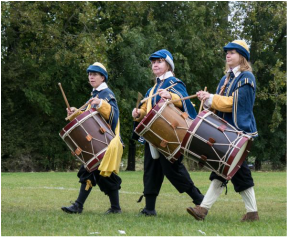 In the 17th century, drummers would have had their coats provided by the colonel of the regiment and these would often have been of a different colour and style to the coats of the common soldiers, with collars decorated with lace.